Released in the Poolside collection. Repromoted in 2013 as part of the It's All Peachy Ombre Nail Kit, and in 2015 for Summer Favorites. Described by China Glaze as a "Neon Coral." 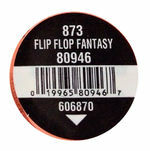 Flip Flop Fantasy was released as a gel polish during the initial launch of Geláze in 2014. Number 606291. This page was last edited on 27 May 2018, at 17:55.